After attending DePauw University (above), which has direct ties to Eli Lilly, Brad Stevens ended up working for the pharmaceutical giant. After college, future Celtics coach Brad Stevens joins a global pharmaceutical company. A multibilliondollar corporation views him as one of its brightest stars. His future seems set. But he misses basketball and he has to ask himself: Do I love the game enough to abandon a career in this field? And so, during his senior season in 1998-99, the once-heralded recruit averaged fewer minutes (15.2) and points (5.4) than he did as a freshman. He was once a star, but not anymore. The transition wasn’t easy, and Stevens spent many nights discussing it with his then-girlfriend and current wife, Tracy. “Those were some hard times,” she said. When Stevens was growing up, it was Hoosier Hysteria at its finest. This is where the game took hold of the future Celtics coach. Now, Stevens is not outwardly emotional, said Josh Burch, a senior teammate that year. “I say ‘outwardly’ because it’s undervalued how that fire burns within him,” Burch said. And that fire burned on the court. 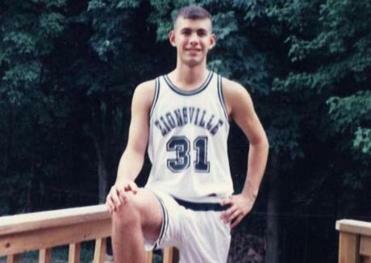 Toward the end of his junior year at DePauw, Brad Stevens said, he realized that he wouldn’t play beyond college. Stevens’s new role at DePauw, though, was to be more of a coach than a player, which he’d done to some extent through the years, checking in with teammates before games or offering guidance during them. In fact, a high school teammate, Ryan Hidinger, recalled how, after timeouts, Stevens often would tug on the back of a teammate’s jersey and offer a small but vital tip. Keep your man from going left and we’ll be OK.
Watch No. 42, he’s looking to shoot. And so, after letting Howland have it during drills, Stevens would take the freshman aside and explain nuances of offense and defense. Stevens’s mentorship of the freshmen during his senior year earned him DePauw’s Coaches’ Award for being the one who cared most about the team. Three years after that, those former freshmen led DePauw to a 24-4 record, a No. 4 national ranking in Division 3, and a berth in the Elite Eight — success Fenlon credited to Stevens’s actions as a senior. Stevens graduated with an economics degree in 1999 and headed to Eli Lilly, an Indianapolis-based pharmaceutical giant that generally hired only business students, but took on Stevens because he was so impressive during a summer internship. And of basketball? He had devoted so much of his life to the game, not only playing it, but studying it. “I could ask him about any player from any part of the state, and he knew him, and he knew the coach,” Burch said. But toward the end of his junior year at DePauw, Stevens said, he realized that he wouldn’t play beyond college. He believed he’d still be involved in the game, though he wasn’t sure how. Later, Stevens realized how Fenlon’s decision to play freshmen ahead of seniors would shape him, helping to make him into the coach he would become. The steady red glow of the corporate “Lilly” sign atop the 12-story Eli Lilly headquarters is visible from almost anywhere in downtown Indianapolis. The multibillion-dollar company has 37,000 employees in 143 countries around the world, many from Ivy League schools. 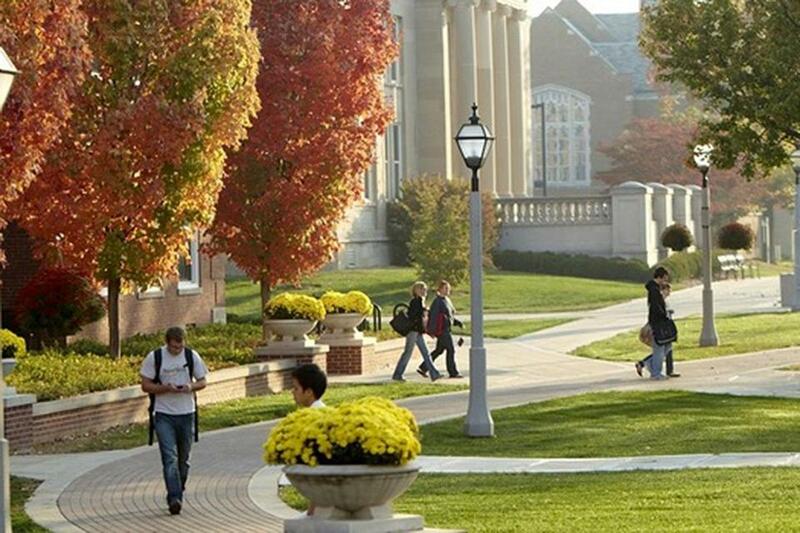 It also has direct ties to DePauw, the college attended by Colonel Eli Lilly, the company’s founder. 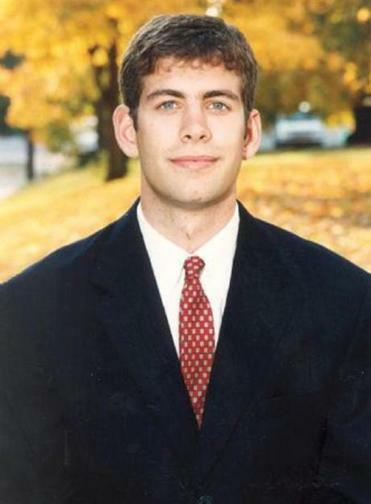 Brad Stevens was a marketing associate whose main role was metrics and incentives for one of the company’s sales groups. From the start, his analytical mind and talent with numbers and spreadsheets helped him stand out. 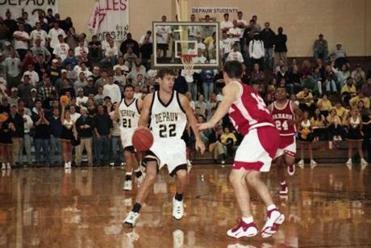 Brad Stevens handles the ball for DePauw University. As a senior, because of a coach’s decision, the once-heralded recruit averaged fewer minutes and points than he did as a freshman. “I knew that if I needed something to get done well, right, and get done early, I was going to give it to Brad,” said Stevens’s manager, Chris Koumpouras, a senior sales executive representative. Though fresh out of college, Stevens carried himself much older. At a national sales meeting in Florida, he addressed a group of about 400 co-workers, including many sales representatives, for whom incentives can be a rather contentious subject. But with no lectern and no notes, he calmly flowed through a PowerPoint presentation, speaking matter-of-factly, removing any chance for conflict. “That’s when I saw the leadership shine through,” said Philip Hutchison, a consultant in information technology. Stevens excelled at boiling down complex information and translating it to people throughout the company. It was clear, said Chris Fletchall, a senior director of ethics and compliance for global operations, that Stevens had “a very bright future” at Eli Lilly. Stevens also played in the competitive division of Lilly’s corporate basketball league, which had team names such as Five to Give, Take No Prisoners, and the Lilly Legends. Several former Division 1 players and former NBA guard Scott Haffner played in the league. “He wasn’t bashful about shooting,” said Pat Bruen, who played against Stevens. On the side, Stevens was a volunteer assistant at Carmel High School, an assistant coach for the Municipal Gardens AAU team, and a coach at Butler University’s youth basketball camps, and he played in adult rec leagues and pickup games throughout the city and suburbs. The game still consumed him. Micah Shrewsberry, a friend and graduate assistant at the University of Indianapolis, recalled Stevens peppering him with X’s-and-O’s questions: What are you guys doing? How was practice? What did you guys do in practice? While working at one of those Butler camps, Stevens caught the eye of Butler assistant coach Thad Matta, who remembered him as hard-working, someone who handled every detail of the camps personally, including handing out pizza and cases of water. Stevens asked Matta question upon question about recruiting, offense, defense — everything. “You saw his thirst to get into the coaching ranks,” Matta said. Before Matta became Butler’s head coach in 2000, Stevens made him aware that while he liked his job at Lilly, he had thoughts about leaving. It wasn’t just that he missed the game; it was that he missed the competition. Matta offered Stevens an unpaid assistant position. To accept it, Stevens had to leave a $44,000-a-year job at a billion-dollar company that valued him. If he were 30 and had that same job at Lilly, Stevens said, he would’ve never left, because by then he would have had children, responsibilities. But he was 23, and he had time to chase a passion that might lead nowhere. It was not a snap decision. He consulted with friends and family. To many of them, the shock of such a move subsided when they considered that his heart was — and always had been — in basketball. Stevens’s AAU coach, Red Taylor, told him as much and said that if he didn’t take the job, he’d regret it for the rest of his life. Stevens’s Lilly colleagues told him that if, for any reason, he wanted to come back, he always would have a job there — something they say holds true to this day. Stevens planned to wait tables at Applebee’s for money, but before he started at Butler, a Bulldogs assistant coach was arrested for soliciting a prostitute. That coach resigned and a position opened up. Matta offered Stevens the job as director of basketball operations, at $18,000 a year. Stevens joined a talented staff featuring three future Big Ten coaches in Matta (Ohio State), John Groce (Illinois), and Todd Lickliter (Iowa), who took Stevens under his wing. Lickliter is a former high school history teacher with two-plus decades as a coach who believes in the details. He believes in them because his father and high school basketball coach, Arlan, was an “incredible stickler for detail.” He believes in them because he lacked skills and athleticism as a player and needed every edge possible. “The guy who gets the least amount of credit is Todd Lickliter. From my perspective, there’s no way I’d be where I am without him,” said Brad Stevens, (second from right), on Lickliter (left, shown coaching Butler during a 2007 NCAA Tournament game). When Lickliter was an administrative assistant, it all had to be exact — the particulars of the lodging, the team meals, the timing of each item on the itinerary. And when Stevens wrote a scouting report, Lickliter, by then an assistant, might remove one comma, statistic, or word. “I started learning, this is how exact it needs to be,” Stevens said. In the film room, three VCRs demanded a mountain of time to make one edited tape that Lickliter might watch and then request that the plays be sequenced another way. “There were a couple times where I probably was like, ‘Are you kidding me?’ ” Stevens said. He learned that because NCAA rules mandate that coaches have only so much time to spend with players, those minutes were precious, as was every iota of information. It all mattered. Above all, Lickliter preached efficiency. There were coaches who, out of fear, tried to cover everything with their players, as if all material carried equal weight. If you take that approach, Lickliter said, you’ll overload the players and they’ll lose focus. But if you don’t do your homework, you could miss something important. “It’s our job to look at as much as we possibly can to get it down to as little as we need to present,” Lickliter said. Information could be harvested from film, analytics, word of mouth, anything available on the opposition as well as your own players. And if there was a chance to watch individual workouts, Stevens was there. If Lickliter was breaking down film, Stevens was in there. And it wasn’t long before Stevens, who in his first Division 1 film session thought the coaches were speaking another language, started to notice those details on the screen. In staff meetings, Stevens was quiet, with eyes always in motion, a mind always absorbing, calculating what worked, what didn’t, and why, Matta said. With Lickliter’s tutelage, Stevens channeled that mind and ultracompetitiveness into a quest for the perfect game plan. “He didn’t have one good scout and one bad scout,” Lickliter said. “His scouts were on. The concept is simple, applying it isn’t, as it requires constant, intense focus. A scoring “run” was not discussed, nor was momentum; only the play at hand. Each possession was a mini-game — any of which could decide the game itself. But by using a process-oriented approach, Stevens learned that even if he knew what the next six steps were to a plan he might have for a team, he could only complete Step 1 first, then Step 2, and so on. It helped him compartmentalize his thoughts, “which for me is really important,” he said. Ever since, “process” is one of the most-used words — if not the most-used — in his vocabulary. 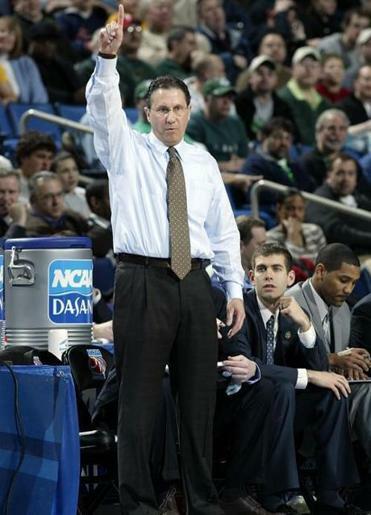 Lickliter was named Butler’s head coach in May 2001 after Matta left to coach Xavier, and in 2001-02, Lickliter promoted Stevens to a full-time assistant. For six seasons, Stevens served as an assistant to a man who believed in the details, turning Stevens into a man who believed in them just as much — if not more so. In 2007, Lickliter was hired at Iowa. Stevens replaced him at Butler, inheriting a strong program that won 29 games the season before and had reached the Sweet 16 of the NCAA Tournament twice in five seasons. He took over a team that returned five senior starters. At age 30, Stevens was the second-youngest coach in Division 1. That was the most notable fact about him upon his hiring, but in a few short seasons, he’d be recognized for much, much more. Baxter Holmes can be reached at baxter.holmes@globe.com. Follow him on Twitter at @BaxterHolmes.